I'm interested in old clockmakers and I recently found the following reference in some transcriptions of the Notts Quarter Sessions held at East Retford 22nd April 1737. "John Tompson, of East Retford, clockmaker, indicted for keeping and carrying a gun charged against 33 He. 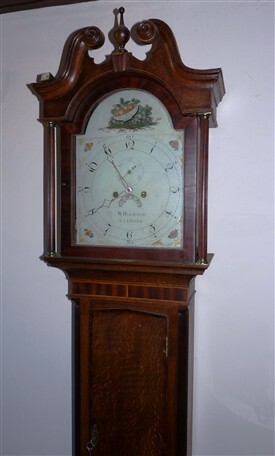 8th, pleaded not guilty, and was acquitted, nobody appearing to prosecute or give evidence against him"
Does anyone know of this clockmaker or any examples of his work? 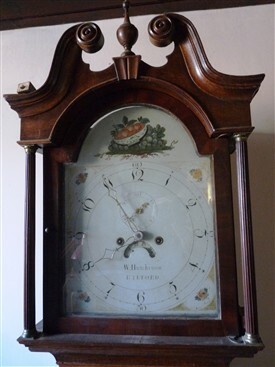 Alex Bienek sent in the first two pictures on this page through to ournottinghamshire@gmail.com They show a clock made by William Hutchinson of Retford. Alex wonders, however, whether Hutchinson was in a hurry when he made this one as he has spelt Retford wrongly on the dial - he puts 'RTEFORD'! This page was added by Website Administrator on 21/01/2016. I have photo of another example of his work, but I can't see how to put a photo on this thread. Hi Alex - thanks for contacting OurNotts. If you could email the picture to ournottinghamshire@gmail.com we would be most pleased to add it to the website.